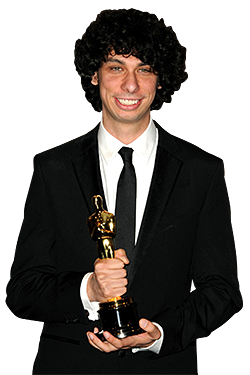 In an Oscar ceremony low on high points, most everybody seemed to agree that one of the evening’s best moments came when Luke Matheny, recently a film student at NYU, accepted an Oscar for Best Live Action Short for his inventive romantic comedy God of Love. Very tall, with a shock of dark curly hair that he publicly regretted not cutting, Matheny gave a sweet and polished speech that also displayed just enough of his goofy charm to immediately win over the audience. We caught up with him via phone after a rather eventful night to ask him how he’s doing. ‪Well, you know, at the nominees luncheon, they drilled all of the nominees about meticulously practicing their speeches to finish within 45 seconds. Apparently, I was the only one who took this seriously. So, I had been practicing nonstop. And at that point, I was just ready to recite the speech and was hoping I finished in time. ‪I guess practice helps. I mean, really, I’m not kidding — I practiced that speech so many times. ‪You’re a pretty recognizable figure: You’re tall; you’ve got a lot of hair. Have a lot people been recognizing you today? ‪Well, the funniest was this morning. Last night, I lost the keys to the apartment I was staying in. And this morning my car was towed. So, when I went to pick up the car at the tow station, I said to the attendant, “Guess what happened last night?” And he said, “You won an Oscar!” Later, we had brunch at this place the Griddle, and a bunch of people came up and said congratulations. I guess right now I’m just in a zip code where everyone saw the Oscars last night. ‪Yeah, that. Then we went to the Vanity Fair party. We tried to get into Madonna’s party, but it was at capacity. So we called it a night — there were like eight of us — and went to Mel’s Drive-In. We finished the night with milkshakes and waffles and drunk people coming up to us wanting to hold the Oscar. ‪Oh, the engraving they do at the Governor’s Ball. That was great. Aaron Sorkin was a couple of steps behind us, and Natalie Portman came in while we were there. I think maybe meeting Tom Hanks, and freaking him out when I told him I had an eight-foot-tall poster of Joe vs. the Volcano at home. I don’t think that’s the film he gets the most compliments on. But really, in person he is just as nice and down-to-earth as you’d expect. ‪Sasha [Gordon, Matheny’s partner and collaborator] and I are going to try and get away a bit tonight. We’re flying back to New York on Wednesday. I will try to field a bunch of media requests, and then I’ll lock myself up and polish this script I was working on, hoping I can use some of this Oscar momentum. I also currently have 164 unread e-mail messages and 150 text messages I need to reply to! ‪Well, it was pass/fail and I passed. But I have to say, the NYU community was always very supportive of the film. My films have a somewhat breezier style than a lot of the other films that get made there — the other ones tend to be a bit more serious. But everybody’s been incredibly supportive and helpful. ‪I know! I can recite that review word for word! It was the first good review I ever got.